Every month we offer great special savings on cosmetic treatments and products and share info on the latest new treatments options to help you look your best. Keep checking back to stay updated about our the latest news and special events going on here at Movassaghi Plastic Surgery and Ziba Medical Spa in Eugene. Or better yet, use the form to the right to sign up for our newsletter and we’ll send the latest news right to your inbox! Enjoy a mini HydraFacial treatment! HydraFacial® is a gentle exfoliation and relaxing resurfacing treatment that delivers long-term skin health with instant, noticeable results and no downtime or irritation. Using patented technology, HydraFacial removes dead skin cells and extracts impurities while bathing the skin with cleansing, hydrating, and moisturizing serums. Reserve your 15 minute session now, space is limited. 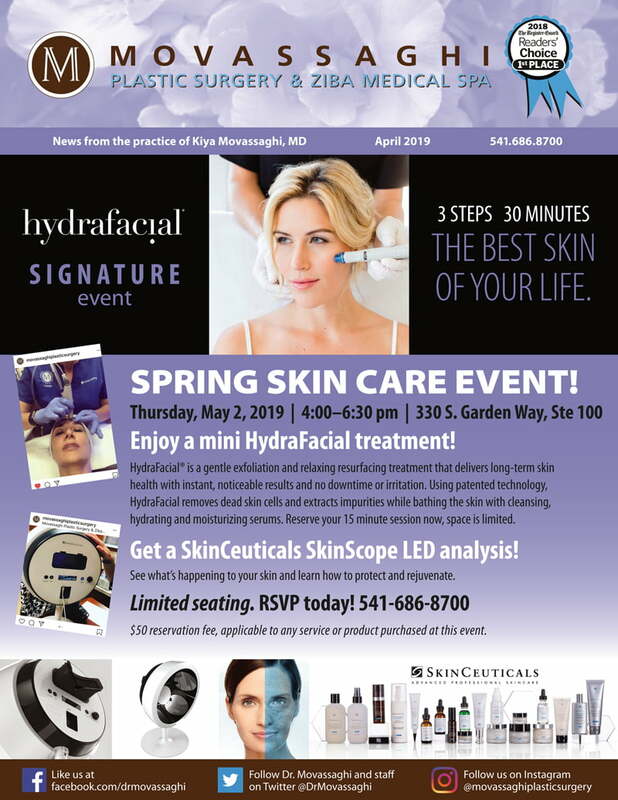 Get a SkinCeuticals SkinScope LED analysis! See what’s happening to your skin and learn how to protect and rejuvenate. $50 reservation fee, applicable to any service or product purchased at this event. Natrelle® INSPIRA breast implants are a top choice for our breast augmentation patients, offering a beautifully full shape with a remarkably soft, natural feel. *Terms and conditions apply; for qualified augmentation patients only. Must be first experience with BOTOX® Cosmetic or CoolSculpting® treatment. Patient has the ability to choose any physician of her choice. BOTOX® Cosmetic is available by prescription only. CoolSculpting® treatment is available only if physician has the CoolAdvantage™ applicator. A CoolSculpting® treatment is 1 CoolAdvantage™ cycle. CoolAdvantage™ is indicated for treating the abdomen, flanks, and inner thighs. Read past newsletters and articles on our newsletter archive. To stay informed of our news and specials, follow us on social media.